The worlds first and only metal band who sings in the rawest dialect on the planet; Skånska. A combination of brutality and melody, delivered with personal lyrics and saucy singing. The follow-up to critically acclaimed debut album "666 Personligheter / 666 Personalities" is called "Häxa" and the release is set to September 17th. 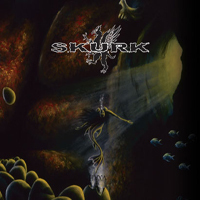 This follow-up is steeped by a dark yet justified soundstage and with help from great mixing and great efforts from the band, S.K.U.R.K has now taken their sound to a whole new level.